Lemon Blueberry Ice Cream. Omg this healthy ice cream might be my most favorite ice cream yet. It only contains 2 tablespoons of sweetener in the entire recipe! Can you say that about store bought ice cream. Probably not. 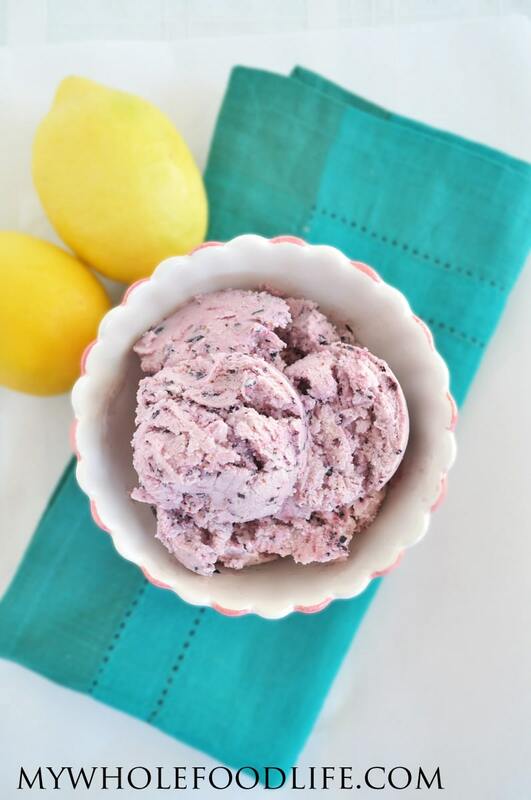 All you need is 5 simple ingredients to make this lemon blueberry ice cream! If you like my blueberries and cream popsicles, you will love this! This blueberry ice cream is vegan, gluten free and paleo approved. Super easy. You can make it up in about 20 minutes. I love having an ice cream maker . If you haven’t noticed. It’s much cheaper to make your own when organic ice cream at the store goes for about $6 a small carton. Plus, you don’t get any weird additives like carrageenan. In a blender , combine all ingredients and blend until smooth. About 1 minute. Pour contents into an ice cream machine and turn on. It took about 15-20 minutes to make in my ice cream machine . If you don't have an ice cream machine, you can also pour this into popsicle molds . This ice cream is a soft serve consistency. If you like a harder ice cream, just stick it in the freezer for an hour. If you want to make sure the ice cream stays soft enough to scoop out, you can add 2 tsp of vodka to it. I like to store my ice cream in these tubs . Enjoy!